This section should be read in conjunction with 4.2.1 – Develop a communication strategy to exchange information with those assisting a Forest School programme as there is crossover. The forest school sessions I’ve been running to date have all come under the umbrella of a charitable organisation I’ve set up. There is no fixed site so different programmes of sessions have been running in different locations. This has meant communication methods have varied depending on where the sessions are based and which group or organisation and involved. 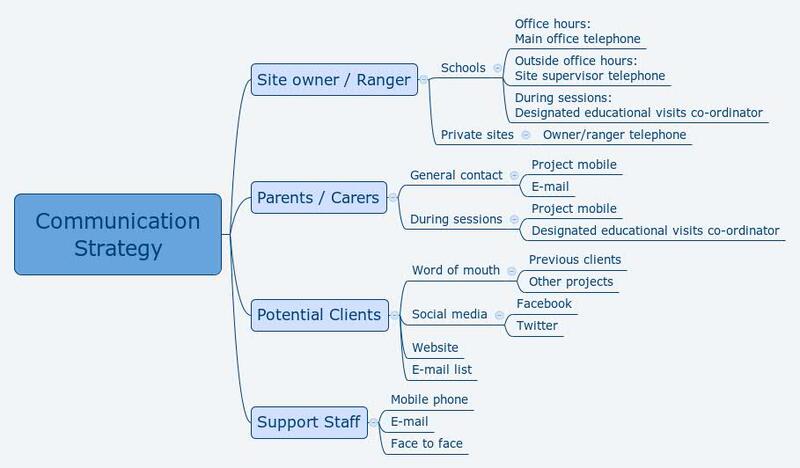 The communication plan above shows the generic methods of communication with different groups of people. On private sites the owner or ranger is generally the point of contact and are usually somewhere on the land, though generally not at the forest school site, during sessions. When running sessions with schools on school grounds there is usually a member of school staff on the site used for the session and if not just a short distance away in the school buildings. Every school has a designated educations trips co-ordinator so school sessions taking place off school sites have a clearly defined point of contact and often a school mobile phone is taken along. For private sessions parents and carers are given a mobile number for a project phone that is a taken on sessions. For schools and other organisations they also have this but in addition benefit from the organisations usual communication strategy. This is usually a ‘trip’ phone that is held by a member of staff from the organisation. What we’ve been doing so far is on a very small scale and email and telephone has been sufficient with landowners, organisations and parents and carers.. As the project grows I’m hopeful we can secure larger pots of funding and expand the number of sessions we can offer. A website, email list and social media profiles are set up, but not live yet, ready to support communication as we grow. As mentioned above as the organisation grows the communication methods will have to expand to reach more people. Word of mouth is currently providing more opportunities for work that it’s possible to fit in around my main jobs and those of colleagues who run the sessions with me. I’m a big fan of word of mouth advertising. People who’ve heard of what we’re doing this way tend to have a far more accurate idea of what forest school is about. The sessions are currently run under a charitable organisation and are offered for free or at cost on a ‘pay what you can‘ basis. In the future I would like to be able to work my main job less (or ideally not at all!) in order to put more time into this and other similar projects. If we’re ever in a position where charges for sessions have to be re-evaluated it will undoubtedly affect the amount of work. As well as hearing about the project through people we’ve already worked with I’ve also made some potentially useful contacts through other projects I am involved with such as Lichfield Re:Cycle.